What a difference a year makes. 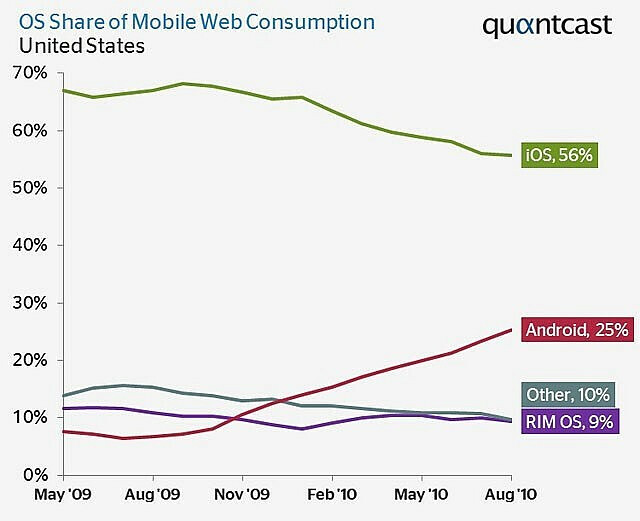 Last August, Android only accounted for a scant 8% of all mobile web consumption in the US. Now, just twelve months later, that number has more than tripled. According to a new report from Quantcast, Google's mobile OS now has a 25% market share. Meanwhile, iOS has fallen by 11 points in that same period, resulting in a current share of 56%. Much of Android's success can probably be attributed to the release of a number of popular handsets over the past year, including the Droid, Evo 4G, and Samsung's Galaxy S line. Google also enjoys a significantly larger base of potential customers than Apple. While the iPhone is currently available only through AT&T, Android devices are being sold by all four major US carriers. Neither Apple or Google's spokespeople have responded to the report yet - but if recent events are any indication, we might have some interesting press releases to read over the next few days.